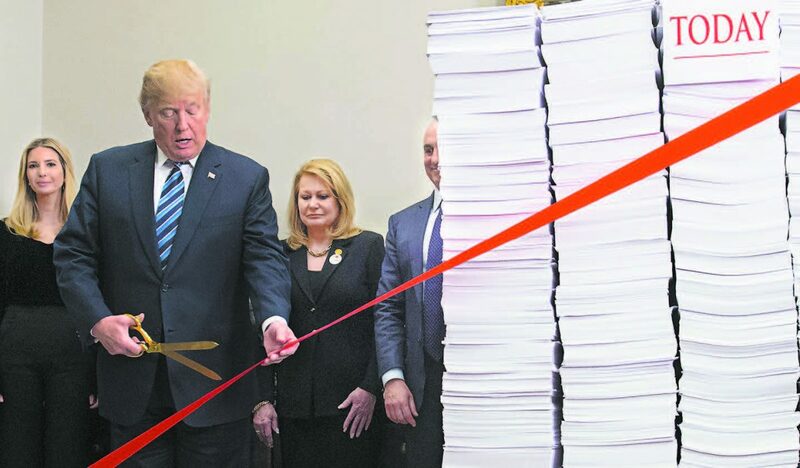 While election conspiracies and dossier whodunits are front-page news, mainstream media hardly covers the dramatic shift in regulatory policy during President Donald Trump’s first year. However, this is another campaign promise that Trump has fully delivered on. His predecessor’s unparalleled rulemaking has almost stopped completely, and most of the signature regulatory initiatives implemented under former President Barack Obama have been blocked or rescinded. By almost any standard, the pace of reform is impressive. Candidate Trump repeatedly vowed to cut regulation “massively” and to “remove the anchor dragging us down.” Indeed, independent estimates peg the private-sector cost of U.S. regulation at more than $2 trillion annually, more than income tax collections each year. The Obama administration alone increased the nation’s regulatory burden by more than $122 billion annually. Combined with the red tape imposed during the administration of President George W. Bush, regulatory costs have increased by at least $200 billion annually during the past 15 years. The benefits of regulatory reform are numerous and well-documented. In a recent report on “The Growth Potential of Deregulation,” the Council of Economic Advisors conservatively estimated that excessive regulation cost the United States an average of 0.8 percent of gross domestic product growth per year since 1980. Trump did well despite the office of the president’s limited authority to modify regulation under the U.S. Constitution. The White House cannot countermand regulatory directives by Congress, although the president appoints agency heads who exercise latitude in rulemaking priorities. Presidents can also guide agency action through executive orders, “guidance” documents, and budgeting. But reform is hindered by the immensity, complexity, and lethargy of the federal regulatory apparatus. A simple repeal requires adhering to administrative procedures, such as analyzing alternatives and presenting justification for public notice and comment. Litigation is rampant and protracted. Ultimately, however, reform is difficult because powerful forces favor the status quo. That is, regulation is a political spoils system by which various special interests impose their will on the public and profit from government favor. That makes the Trump administration’s deregulation efforts an epic struggle. Every way in which the White House presses its reform agenda challenges the legitimacy of the existing regulatory regime. For this reason, Trump is pursuing a multifaceted reform agenda. For example, he has reversed his predecessor’s use of executive power by revoking the “guidance” dictating that transgender students have the right to use public restrooms that match their gender identity. Likewise, Trump issued exemptions from Obama’s far-reaching contraceptive mandate that required employers to offer health insurance coverage for all contraception approved by the Food and Drug Administration, including medications and devices that may act as abortifacients, as well as sterilization procedures. As part of a broader effort to scale back Obama’s substantial array of global warming programs, Trump announced the United States would withdraw from the Paris climate agreement, Obama had signed as an executive agreement on April 22, 2016. The president’s authority to appoint the heads of executive branch agencies (under the Appointments Clause of the Constitution) is among the most effective, although the power to dismiss imprudent administrators may be even more potent. Of particular significance was the appointment of Scott Pruitt as administrator of the Environmental Protection Agency (EPA). Pruitt has proposed the repeal of the Clean Power Plan, the centerpiece of Obama’s costly climate change initiative. He likewise is leading the effort to rescind Obama’s Waters of the United States rule, which imposed a new definition for the waters the federal government can regulate under the Clean Water Act. The broad definition, if enacted, would infringe on property rights and override the role of states in water stewardship. In addition to initiating a variety of other regulatory repeals, Pruitt halted the EPA’s manipulation of judicial review with a directive to end the agency’s “sue and settle” scheme. For years, EPA regulators worked in concert with advocacy groups to engineer legal settlements resulting in more stringent regulation by precedent than it could have enacted following the formal rulemaking process. Similarly, Attorney General Jeff Sessions ended the Obama administration’s practice of funneling billions of dollars in settlement funds to left-wing allies. Republican Ajit Pai, a career official of the Federal Communications Commission appointed by Trump as its first Indian American administrator, also slashed red tape. The commission reversed the 2015 “net neutrality” rule (formally titled the Open Internet Order), which subjected internet service providers to regulations crafted decades ago for telephony. However, the process of regulation is so ingrained in the political system that it’s not always possible to shift into reverse. The administration inherited 1,985 regulations in the rulemaking pipeline, 966 in the proposal stage and 1,019 in the final stage. The administration’s new Unified Agenda of Regulatory and Deregulatory Actions reflects the withdrawal of 635 previously listed rulemakings, another 244 regulations rendered inactive, and the delay of 700 rulemakings. The agenda also commits federal agencies to cutting future regulatory costs to the private sector by $9.8 billion. Nonetheless, federal rulemaking slowed dramatically in 2017, with the Trump administration issuing two-thirds fewer regulations in its first year (1,209) than the administrations of both presidents Barack Obama (3,356) and George W. Bush (3,233). The number of “major” rules, those anticipated to cost the private sector $100 million or more annually, numbered just 32 in Trump’s first year, compared to 73 under Obama and 51 under Bush. 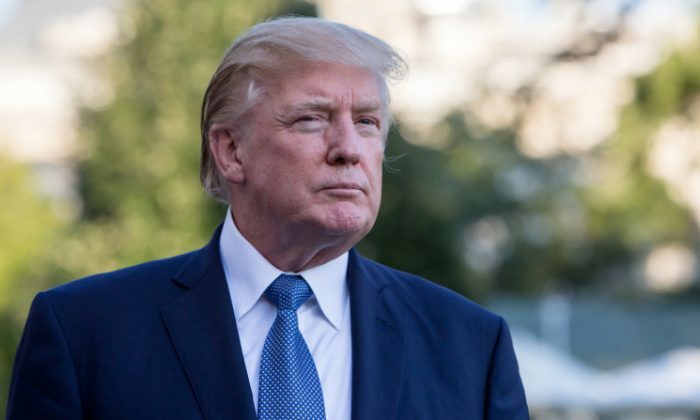 The president has also issued a variety of executive orders (EOs) and presidential memoranda directing agency administrators to take specific regulatory actions. Signaling a major change in energy policy, for example, the president directed agency officials to expedite requests for approvals to construct and operate the Dakota Access Pipeline, and to invite TransCanada to resubmit its application for construction and operation of the Keystone XL pipeline. Two other executive orders are intended to have a direct and substantial impact on the extent of future rulemaking. EO 13771 directs agency officials to identify for repeal at least two existing regulations for every new regulation they promulgate and White House officials have even raised the goal to eliminating three regulations for each new one issued. The order also calls for a budgeting process to manage regulatory costs, and prohibits any increase in the total incremental cost of all regulations unless required by law or advised by the Director of the Office of Management and Budget. The regulatory budgeting established in EO 13771 is intended to inject economic discipline and rationality into rulemaking. If agencies are compelled to restrict the costs imposed on the public, they must engage in a type of rolling retrospective review of the vast accumulation of rules that comprise more than 185,000 pages in the Code of Federal Regulations, up from 138,000 in 2000. From the administration of President Jimmy Carter forward, agencies have been directed by the White House to conduct some form of regulatory look-back. But absent a fixed numeric or budgetary target, as called for in Trump’s order, there has been little accountability and thus past initiatives have largely failed to reduce regulatory costs. EO 13777 directs the head of each regulatory agency to designate a Regulatory Reform Officer to oversee the implementation of regulatory reform initiatives and policies within the agency. Under the order, each agency must establish a Regulatory Reform Task Force to evaluate regulations and recommend those appropriate for repeal, replacement, or modification. By directing agency staff to control costs, sound regulatory practices are internalized. The creation of the regulatory task force is intended to broaden the search for regulations that eliminate jobs or inhibit job creation; are outdated, unnecessary, or ineffective; impose costs that exceed benefits; are insufficiently transparent to meet the standard for reproducibility; or implement executive orders and other presidential directives that have been subsequently rescinded or substantially modified. As significant as Trump’s actions have been to date, a great many reforms remain unfinished and numerous legal challenges are undecided. But the president is obviously undeterred, telling the World Economic Forum in Davos, Switzerland, “We have undertaken the most extensive regulatory reduction ever conceived.” Hyperbolic though that may sound, this administration has already delivered significant, tangible reforms and is certain to deliver more. Diane Katz is a senior research fellow in regulatory policy at The Heritage Foundation and a guest expert at Geopolitical Intelligence Services. This article was originally published by GIS Reports Online.